The lineup at Uncle Tetsu, a popular Japanese cheesecake franchise that opened a branch in Burnaby eight weeks ago, snakes endlessly as the sweet smell entices customers. 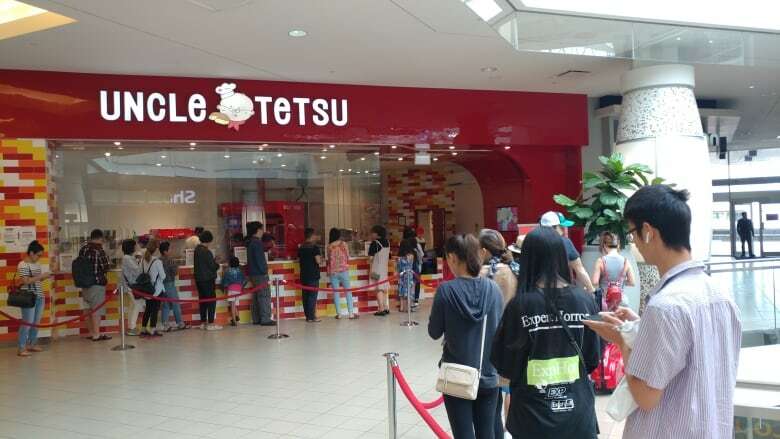 The lineup in front of Uncle Tetsu, a popular Japanese cheesecake franchise that recently opened a branch in Burnaby's Metrotown mall, snakes endlessly as the sweet smell entices customers forward. Some come out of curiosity, others to feed a craving and one man in the hopes of placating his upset wife. "Every time I walk by, there's a three-hour lineup, so I figured today I'd drop off the kids at summer school and line up right away and hopefully get in there early," says Janice Flormata, a self-described cheesecake lover. Flormata might even save a slice for her children — if it lasts past noon, the time they get home, she tells CBC's Jake Costello with a laugh. 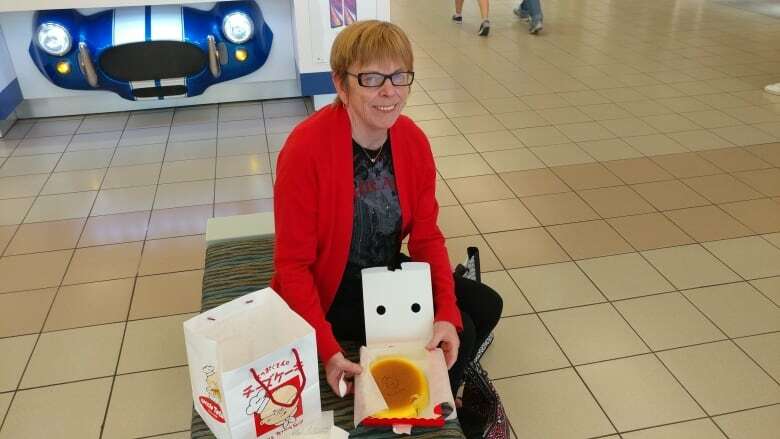 Virginia Graham, who lives across the road from the Uncle Tetsu, has noticed the long lines and wants to see if the sweet treat is worth the wait. "Every time I come over, it's like a two- or three-hour long line up," Graham says "I was walking home so I thought I'd give it a shot." One man hopes scoring a piece of the sought-after dessert will please his wife. "My wife is pretty upset today and I need to do something," he said. "I'll tell her I waited for over an hour to get this cheesecake and probably she's going to be happy … Sometimes you make lies to make people happy, it's not fraud." The man declines to give his name. Other passersby stop to ask what all the fuss is about, but when they hear people have been waiting half an hour, they continue on their way. Delong Wang, who's running errands at the mall and had previously tried the cheesecake in China, doesn't care about the chain's wait times or popularity. He just wants a snack. "It's so-so, it's like average cheesecake, the same taste," Wang said. "I just want some cheesecake."